With Horncastle Town losing at home to second placed Wyberton and third placed Skegness Town coming out on top in the seaside derby, Sleaford Town Reserves’ lead at the top of the Balcan Lighting Supplies Lincolnshire League has been trimmed to five points after they lost for the first time. Sleaford’s unbeaten start to the season has finally ended as, with eight straight league wins under their belt, the leaders were looking to enter 2016 with their 100 per cent record intact. But champions Hykeham Town, who had already beaten them twice in the Supplementary Cup, completed the treble with a 4-1 success at Eslaforde Park. Meanwhile, Market Rasen Town lost to Brigg Town Reserves for the fourth time this season which saw the latter climb to fourth in the table. The match between Ruston Sports and CGB Humbertherm was postponed after the Therm failed to raise a team. In the Lincolnshire FA Junior Cup, Cleethorpes Town’s Development Squad was knocked out by former Lincolnshire League side Limestone Rangers. Both sides finished with 10 men as Wyberton won the battle of The Wong. 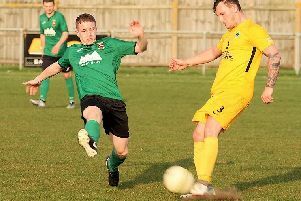 The villagers, who dropped points when they were held to a draw by Horncastle in November, romped home with goals from Dan White, Daniel Maddison, Scott Dawson and Grant Butler. Brigg Town’s second string completed a league and cup quadruple over Market Rasen Town at The Hawthorns. Leading marksmen Ryan Thompson and Ben Brown did the damage with the goals. After suffering only one defeat in the last seven games Brigg are now fourth. Bottom of the table Rasen’s goal was scored by Jake Wade. With home and away Supplementary Cup victories over the league leaders, champions Hykeham Town travelled to Eslaforde Park without any fear. And goals from Robin Newman, William Drury, Craig Leverett and Callum Chapman lifted them to seventh in the table. Sleaford’s top scorer Nathan Thompson took his season’s tally to 12 in all competitions with the home side’s consolation goal. Skegness Town grabbed the local bragging rights with a convincing win at neighbours Skegness United, who had James Cole sent off. Liam Parker gave the Lilywhites an early lead to settle the nerves and that was how it remained until they turned round with the wind on their backs. Courtney Warren’s far post header doubled the lead in the 57th minute and a minute later Luke Rayner-Mistry drilled home Town’s third. Josh Bartlett made it 4-0 from the penalty spot after Cole picked up a yellow card for an infringement in the box. Shortly afterwards, Cole received his second yellow for a poor tackle on former United man Arron Scutt. Town skipper Ben Davison wrapped up the scoring in the 69th minute when he glanced home Wade Hurst’s cross. The re-arranged county cup tie between Cleethorpes Town’s Development Squad and Limestone Rangers saw the Lincolnshire Leaguers knocked out. Philip Spindley grabbed a brace of goals for the visitors. Max Batty was also on target and there was an own goal as the Scunthorpe League side eased their way into the quarter-finals.